Rudge Whitworth Cycles was a British bicycle and motorcycle manufacturer that resulted from the merger of two bicycle manufacturers in 1894, one of which descended from the original bicycle company founded by Daniel Rudge. Rudge motorcycles were produced from 1911 to 1946. The firm was known for its innovations in engine and transmission design, and its racing successes. Their sales motto was "Rudge it, do not trudge it." The company also produced the first detachable wire wheel in 1907, and was known for its knockoff wheels on sports cars well into the 1960s. With the depression biting, 1933 was the last year of production for dirt track bikes, and the TT Replicas. The Ulster 500 cc was fitted with a “semi-radial” (parallel valves with radial ports) cast iron head. For 1934 the Ulster had its head cast in aluminium bronze, and a radial 4 valve 250 cc Sports was released. Rudge motorcycles took the first three places in the 1934 Lightweight TT. A two valve 250cc was produced in 1935, and in 1936 the last of the radial 4 valve 250cc model were produced, while round tube forks were introduced on other models. 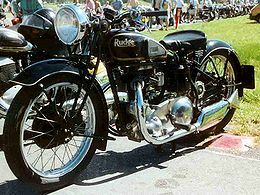 In 1937 the valve gear became fully enclosed on the 500cc models, but finances were bad and Rudge was bought by EMI, and production was interrupted, being moved to Hayes, Hillingdon in Middlesex. A 250cc 2 valve Sports was released in 1938, and for early 1939 the Ulster had an RR50 aluminium cylinder head. Production ceased in December 1939 in order to convert to radar production for the war effort. Rudge bikes finished first, second and third at the 1930 Junior TT using prototype radial 350 cc 4 valve engines. They also took first and second in the Senior TT. The road bike engines were changed to dry sump lubrication. The JAP 250 and the parallel four valve 350 cc ended production in this year. In 1931 Rudge released its first 250cc and 350cc road machines with the radial valve layout. TT Replicas were available in 350 cc and 500 cc. The parallel valve 500 cc was also available in Special and Ulster models, the Ulster now having a 100 mph guarantee. First and second were taken in the 1931 Lightweight TT, and in 1932, second and third. A radial head 500cc was produced for 1932 only. A 250cc TT Replica was built, and the road bikes were fitted with proper oil bath primary chains, and a stand that could be operated “with just one finger”. This page was last edited on 5 March 2009, at 20:59.